'Bahamas Pura Vida'. Romantic and luxurious beachfront home. Spectacular ocean and beach views! Escape here to relax in the sunshine and miles of pink sand beaches and azure turquoise water. This beautiful tropical villa is directly on the beach. Fully furnished and equipped for your pleasure and comfort at one of the most amazing beaches in the world. Great privacy! Pura Vida is tucked away in island tropical foliage. Perfect romantic escape. Snorkeling is yours to enjoy in the beautiful reefs right at Pura Vida. Take an ocean kayak out to a small island just off shore. If you enjoy fishing you can fish right from the shore or deep sea fishing and bone fishing services and guides are available nearby. There are great restaurants within 10-15 minutes. A tropical dream that really comes true at Bahamas Pura Vida! Please click on the 'Reviews' and see what guests say about their visit to Pura Vida. We invite you to come enjoy the real tropical island experience for yourself! As you enter the private drive your senses are captivated by majestic coconut palms and lush, colorful tropical foliage. Fully equipped gourmet kitchen. Great Room with 18 ft. cypress ceilings. HDTV. WIFI internet. Central A/C. Two suites each with screen porch. Facing the ocean are expansive sliding glass doors which captivate with the views of beach and ocean and open up to the wonderful tropical breezes. There are private gardens and palm groves overlooking beach and ocean where you can lounge or sun or just relax with a tropical drink. A perfect honeymoon destination or re-kindle the romance in this exotic and private, tropical villa! Make your island escape. Incredible beauty and privacy. Make memories, an unforgettable tropical vacation. Go to sleep to to the sound of ocean waves. Experience the true island lifestyle. So many people visit Nassau and Paradise Island and think they have seen the Bahamas. 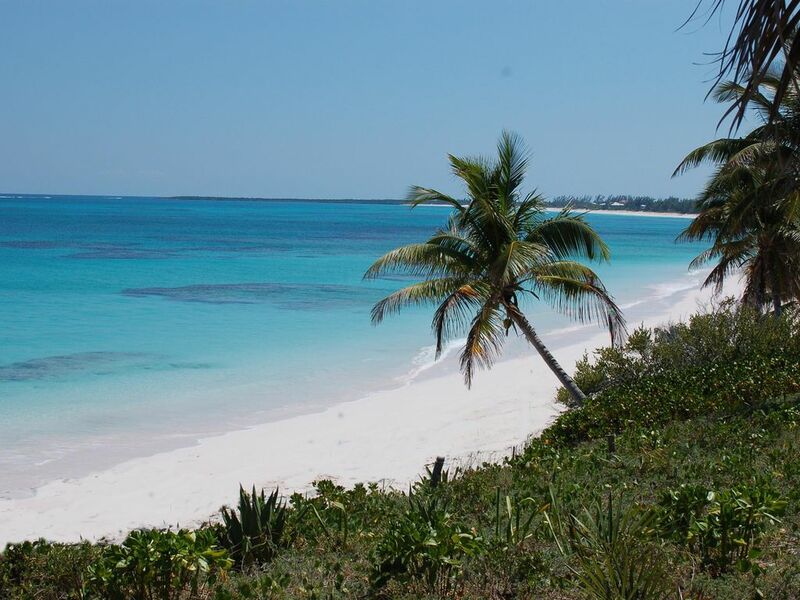 Come to Eleuthera which is only 20 minutes from Nassau but a world away in quaint, laid back island charm. If you would like to do more than just relax at Pura Vida, please check with us for fishing guides, scuba and other available activities. We have been coming to Eleuthera for 18 years and fell in love with the incredible island beauty. It is very romantic and relaxing and we always hate to leave. We hope to spend more time in the future and enjoy making Pura Vida available for others to enjoy! We built Pura Vida and chose Double Bay because it has one of the best beaches we have seen anywhere in the Bahamas. Actually, we have not seen better beaches anywhere! The tropical beauty is unsurpassed! The coconut palms and colorful tropical foliage are incredible and privacy is very special overlooking the pink sand beach with tourquois water! Master Bath in suite. Very spacious. Large double sink vanity. Large tiled shower. Walk in closet. Guest bath has single vanity and tiled shower. Pura Vida is located directly on beach overlooking the incredible azure blue-turquoise ocean! Right on a beautiful pink sand beach! Directly on a beautiful pink sand beach! Walk for miles or swim and snorkel. Pura Vida is well positioned in a private direct ocean and beachfront setting with beach and ocean at your doorstep. Spacious living room with cathedral ceilings. Lots of comfortable seating. Library, HDTV, Movies, Music. Dining area with cathedral ceilings overlooking spectacular ocean views. There is an additional breakfast area looking out to the ocean . Enjoy outdoor dining on the patio and screen porch. Spacious patios overlooking beach and ocean. Beautiful property,very clean, great location, beautiful kitchen. Plenty of room and space. We thoroughly enjoyed our stay at Pua Vida! We can’t think of a thing it was missing. The beach was fabulous. We kayaked out to the larger island. The kitchen was fabulous as we picked up fresh local fish at the docks. The is a very special place. Comfy beds and beautiful furnishings. This was our 3rd time to rent Pura Vida.Our daughter joined us for one of our weeks there and she loved it too.At first there was no WIFI for several days but the caretaker took care of that.All 3 times we were there the phone never worked.This time my new phone allowed me to use WIFi calling and I have a travel plan for $10/day which I used when there was no internet or WIFI.The internet is awesome if you need to stay in touch with your business etc.or do Zoom calls which my husband had to do once or twice.The appliances had all been replaced this time.Everything worked which we haven't seen always in other rentals.The owner is very assessible as well.Can't wait to go back! Thanks for coming to the privacy, beauty and relaxation of Pura Vida! Yes, we replaced appliances and many other items and are constantly working to keep Pura Vida first class and up to date. The phone issue has been resolved by the phone co. In fact, they have just installed a new complete internet system and equipment for Double Bay area which is much appreciated. We welcome you back to escape to Pura Vida and Eleuthera! Great location and house for 4 people with lots of areas to relax without being on top of one another. The kitchen was well-stocked and the beach accessories were much appreciated. Had a little trouble with TV but problem was addressed promptly, although never solved but not a big deal. Owners were easy to deal with and responsive. Loved the location, unfortunately our weather wasn't great but the house made it easier to handle. Thanks for a great vacation! Thanks for coming to Pura Vida and for your patience regarding the the satellite TV service outage. We were able to solve with a new service which took a few days longer than we had hoped. In the islands things sometimes move at a slower pace! We welcome you back again. My husband and I had a lovely stay at Pura Vida! Double Bay is our favorite beach, so it is a treat to stay right on it. The area is secluded and private but conveniently close to groceries and restaurants. The home was ridiculously clean. It was well stocked with towels, toilet paper, tissue, and hand soaps in the bathrooms and kitchen. Our favorite spot was the screened-in patio off the master with the double chaise lounge and spectacular ocean view. It is where we ate lunch every day, and I spent hours reading in there as well. We would definitely stay in this home again! We are so glad you came. Sounds like you really clicked into the relaxing island magic! My wife and I enjoyed this place immensely in early September 2018. Hurricane Florence came about as close as 400 miles from what I could tell. It increased the surf at high tide which reshaped the beach and made it more exciting but presented no danger or problems. I really loved the hammock in the middle of the yard and the screened in porch at night. Everything you need is here, just bring some groceries. We enjoyed restaurant 1648 for several dinners, they are very good. Tippy's seemed to be closed for the season along with some other places. I ran on the beach every morning and never saw another person. Only a couple times did I see anyone later in the day. We enjoyed watching the little lizards and other creatures. Mostly we enjoyed the beautiful ocean sounds and views at a very nice private home. Thank you for sharing your place Steve and Cindy. I expect we will be back next year! Thanks so much for sharing and for the great photos you sent on Google. Sounds like you had a special time at Pura Vida! We welcome your return to experience again the magic at Pura Vida. Pura Vida has such stunning views, from sunrise to sunset and thru to the starry nights! We had shooting stars just above us one night! This is a beautiful and thoughtfully designed vacation home. Very welcoming with so many great nooks and places to eat, read, or work ( if you must. like I did). Great information on island , amazing book and movie collections. The artwork inside, I believe mostly by the owner, is quite inspiring. Two weeks was not long enough, we did not want to leave. Already planning our return! Thanks for coming! We are so glad to share with you the magic of Pura Vida and Eleuthera. We welcome your return! Double Bay has miles of pristine powder pink beaches and clear turquoise waters. Snorkel the many reefs just off shore and enjoy exotic coral, underwater tropical plants and colorful fish. Ocean kayaking is also a great activity as there are miles of coast line to explore and also small nearby islands and cays. Other nearby activities include local colorful festivals, great fishing(guides available), biking, boating, beach-combing or just relaxing in a lounge chair or hammock. Great restaurants just minutes away. Eleuthera is a great island to explore. There are many hidden beaches you can go to where you have the entire beach all to yourselves. A romantic fantasy come true! Golf: There is a 18 hole golf course at Cotton Bay which is 35 minutes south of Pura Vida near Rock Sound. Recommend leaving tip for housekeeper. Our regular weekly rate is $2,650.00 (7 nights) Note: we also offer 5 night reservations May 1st-Dec. 31st, 2018. $360.00 per night The rate for Thanksgiving, Christmas, and New Years is $2,950 per week. (7 nights) If there is a time period showing available on calendar which is less than 5-7 nights between other reserved dates please contact us. $360.00 per night is rate for these periods.